You can find a lot of formats on the FM frequencies. Say that three times fast. Here’s a new group whose name is based on those very radio waves that they’d like to get on. They’re the four guys from Southern California who call themselves Open Air Stereo, a rock band who have been together for several years now. The group consists of Chase Johnson (lead vocals), Nick Gross (drums), Scott Pounds (guitars) and Evan Smith (bass). 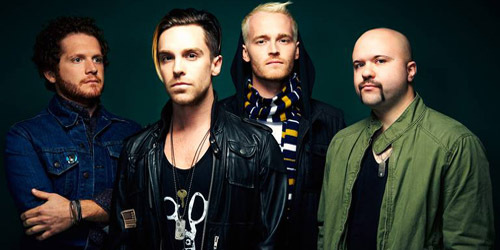 They were originally featured several years ago on the MTV reality (but scripted) show Laguna Beach, where the airtime both Johnson and his group received during the show’s third season led to a record deal with Epic Records and a prominent performance at the Roxy Theatre in Los Angeles. Their star was rising fast. Then, the momentum stalled. Laguna Beach ended after that third season, so their exposure on television dwindled. After a year and a half of creating original material for what would’ve been their first album, creative differences ensued, and the sessions were halted. They split, which I’m sure must have been a hard decision at the time. Johnson pursued some in the studio for a solo record, which was due in the second quarter of 2009, but was also shelved. In the meantime, he managed to get in some hosting gigs as a result of his Laguna Beach fame. Time eventually healed the wounds of the band members and foursome got back together in 2011 and created an album together with the help of producers Gavin Brown, Mike Plotnikoff and Peter Stengaard, along with writer Marti Fredrikson, among some other very talented people. So, after a decade of playing together on and off, they may not be the newest kids on the block, but the world of radio and retail is their playground, at least for the time being. As the beginning of fall comes upon us, Open Air Stereo is preparing to launch their debut single at radio, “Stuck On You”, from the debut album called Primates, which has been out since late May. It goes for adds on Alternative radio on August 13 and is also being serviced to the Hot Adult Contemporary format at a later date. It’s being promoted through Goomba Music, home to a range of harder rock and heavy metal acts, as well as a few more notable names to the mainstream audience like American Hi-Fi and Puddle Of Mudd. Also credited on the label is STRZ Enterprises, based out of Los Angeles, who have a smaller roster of both acts and producers. Neither record group is particularly established at either format, so it shall be an interesting experiment is trying to break an indie release. On the upside, the band has a likable song. “Stuck” has obviously been out there for several months now, but I just heard it for the first time recently and I’m enjoying it. It’s a solid pop/rock song about a guy reminiscing about the memories with his former love who “got nothing to prove” because no matter what happens, they’ll always find themselves back together. It’s sort like the band in itself. Cute. It has a laid-back So-Cal vibe to it, which is refreshing, and with a light-hearted message to it, I think a lot of people will enjoy it. On an album that reflects the evolution of both time and the construction of a band, their many influences are involved, including alternative and ska outfits like the Red Hot Chili Peppers and Sublime. They know their roots and they know their sound. Now, it’s time to make people start appreciating it. On the downside, they are “new” in the sense that this is their first radio single, and the band will need even more time and patience to try to make it nationally. While they easily could’ve been lost in the shuffle with a major label, they also could’ve been properly handled and become a big success. Who knows? Nothing’s a guarantee with a smaller label in terms of the promotional aspect of this forthcoming campaign. Although, I’m sure they’ve benefitted artistically from the jump. We’ll see how far they go. The fact that they even have an adds date is a good sign, so I’m sure they’ll plan everything out and let it unfold. The quartet is currently on tour with 90’s band Candlebox and some additional fall dates will be announced soon, but in the meantime, keep your tuner ready: you may just be hearing Open Air Stereo in stereo at your local radio station soon. Purchase the single “Stuck On You” on iTunes. / Purchase the album Primates on iTunes.